Michele was born and raised in NY, and has resided in Savannah Georgia since 1996. She started her business as a successful muralist, accomplishing a multitude of paintings for commercial, public and residential clients in and around the Savannah area. 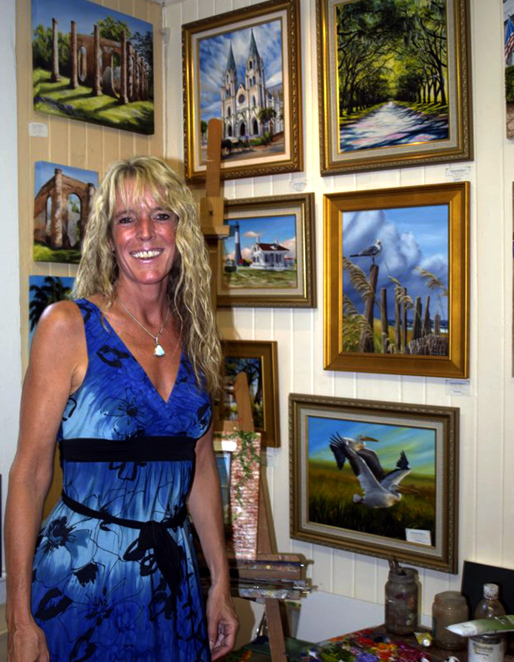 She has created and enjoyed the successful ownership of the Horizon Gallery, ﻿fostering a loving display showcase for local artists, located along the historic river front in beautiful downtown Savannah. She enjoys capturing through her paints the local scenery as well as people and pets. Over the years Michele has perfected her own signature technique . of her time painting on canvas but is still available for select mural jobs. She has also developed a method of creating 'removable' murals. Copyright 2014 Michele Snell Galleries. All rights reserved.